It was a scary moment for Carolina Hurricanes defenseman Calvin de Haan when Alexander Kerfoot’s stick came up and hit him in the eye during last night’s game. The veteran defenseman writhed in pain on the ice for a few moments before leaving the game and travelling to a nearby hospital. GM Don Waddell updated the situation with some great news today, indicating that de Haan avoided serious injury. Calvin sustained an injury to his right eye last night, but was released from the hospital in time to make the flight home with the team. At this point, his eye is responding as we would hope. We are optimistic that he will make a normal recovery without restrictions to his ability to play hockey in the near future. 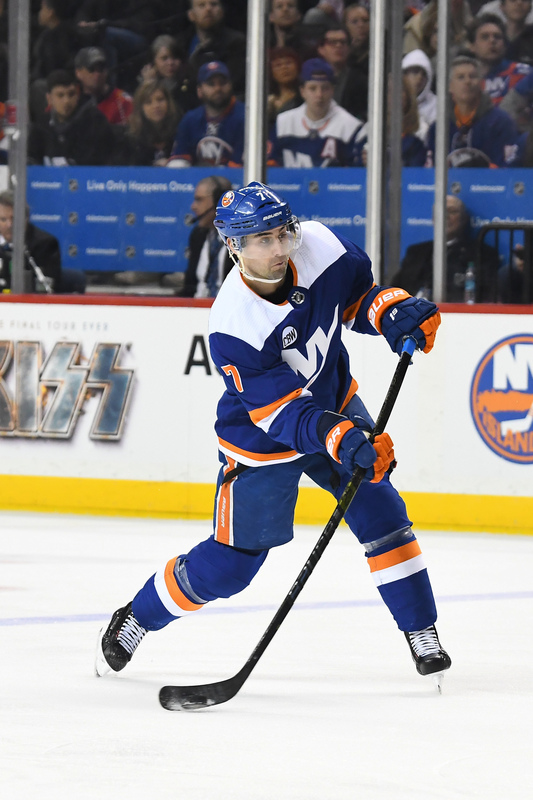 de Haan, 27, has come back strong this season after dealing with injury for much of 2017-18. Signing a four-year, $18.2MM deal with the Hurricanes in the offseason, he has stepped into a valuable role for the team as one of their key penalty killers. Logging nearly 19 minutes a night, de Haan also leads the team in hits with 169 and has contributed 14 points on the season. Getting him back in the lineup quickly will be important for Carolina, who suddenly have jumped into a divisional playoff spot in the Metropolitan. With a 7-2-1 record in their last ten, the team now sits just four points behind the New York Islanders for second in the division and four points clear of a Columbus Blue Jackets team sitting in the final wild card position. There’s no guarantee that they’ll make the postseason, but having de Haan healthy and on the ice in the coming weeks will certainly help. The team has recalled Haydn Fleury from the AHL under emergency conditions for the time being. Two more players sat down for arbitration hearings today, as Sportsnet’s Chris Johnston reports that neither the Ottawa Senators and Cody Ceci nor the Dallas Stars and Gemel Smith were able to come to terms beforehand. Both situations bear watching over the next 48 hours, as they must agree to a deal in that window or else get stuck with the arbitrator’s award. Ceci’s case is similar to that of the Winnipeg Jets’ Jacob Trouba, which went through to a decision earlier this off-season. Both Ceci and Trouba filed at a number that shares few reasonable comparisons – Trouba at $7MM and Ceci at $6MM. While Trouba’s side likely tried to use several recent cases of offensive-minded defenseman who settled for $5.5MM and then argue that he is the superior defensive player, Ceci does not have the comparable offense to make as strong a case. As such, he is unlikely to get the $5.5MM award that Trouba landed, the midpoint of his case. Instead, look for Ceci to get somewhere in the $4-4.5MM range. Smith’s is a much different scenario, similar to another previously decided case this summer, that of Calgary Flames defenseman Brett Kulak. In both cases, the team offered only a minimum, two-way contract while the player filed at a higher value for a one-way deal – Kulak at $1.15MM and Smith at $900K. While Kulak was able to land a $850K one-way deal from the arbitrator, he also played in 71 games in the platform year, while Smith only suited up for 46. Smith faces a far tougher argument that he is a bona fide NHL player at this point in his career. Restricted free agent William Nylander continues to negotiate with the Toronto Maple Leafs, but the explosive young forward is not interested in a short-term bridge deal. Sportsnet’s Luke Fox suggests that Nylander is only talking about a long-term deal right now. While the Leafs might be trying to play it safe, with both Auston Matthews and Mitch Marner also in need of extensions next summer (along with the majority of their roster), Nylander doesn’t seem willing to take a bridge deal only to watch his fellow budding stars sign long-term contracts instead. Nylander may have hit restricted free agency earlier than Matthews and Marner, but the trio all have similar games played and points since Nylander only played in 22 games with Toronto in his first season before the other two joined the squad. All three have been remarkably consistent early on and, given their similarities, it is hard to blame Nylander for wanting a long-term deal when he knows that Matthews and Marner are likely to get them. While it makes sense that the New York Islanders have focused on adding forwards and a new goaltender this season, after losing superstar center John Tavares and starting goalie Jaroslav Halak to free agency, Newsday’s Andrew Gross thinks it’s strange that the team has not added to the blue line at all. The team re-signed Thomas Hickey and Ryan Pulock, but have added no one else while losing Calvin de Haan and opting not to bring back Brandon Davidson and Dennis Seidenberg. Gross notes that recently re-signed center Brock Nelson, an impending free agent, could be used as a trade chip to add to a blue line that struggled greatly last season. There are certainly teams out there with a plethora of defensemen who could use Nelson up front. The Carolina Hurricanes, Boston Bruins, and Winnipeg Jets are clubs that fit the bill, but Nelson would not be nearly enough to land a Justin Faulk, Torey Krug, or Jacob Trouba and an expendable piece that he might fetch, like a Trevor van Riemsdyk, Adam McQuaid, or Tucker Poolman might not be enough to fix the Islanders blue line. New York may have to up the ante beyond Nelson to land a difference-maker on the back end.